I have to admit that I am often lazy when it comes to making lunch on the trail. I don’t drag the stove out very often and in the warmer seasons I actually try to avoid the practice of a cooked lunch. Instead, I turn to fare that does not require cooking or heating. This can be anything from the traditional cheese, cured sausage, and crackers, to something more elaborate such as a trail salad. Breakfast leftovers, such as biscuits, make a great lunch on the go especially if paired with some shelf-stable Brie or Camembert and a bit of nut-based pesto. Red pepper jelly and shelf stable cream cheese is delicious on crackers, as is a little olive and black pepper. Wraps are versatile for the no-cook lunch and are perfect for nut butters and other spreads. Many foods, such as hummus and other dips, rehydrate quickly and easily when you break for lunch. You can buy commercially prepared powdered hummus but I like to make my own. Just use your favorite hummus recipe omitting the olive oil. Dry on lined dehydrator trays for 5 to 7 hours and then process in a blender until you have a fine powder. On the trail, add enough water to reach the consistency you like and stir in some olive oil while seasoning to suit your tastes. Such dips are delicious with crackers, leftover flatbread from dinner the night before, pitas, or even baby carrots. Dips also make terrific spreads for wraps and bagels. Roasted Eggplant Spread is delicious with foil pouched chicken and some trail grown sprouts. If you have something like salsa that contains corn, you can start rehydration at breakfast time and let the ingredients reconstitute while you hike. I simply boil a little extra water when I make my coffee or tea. This eliminates the need to pull the stove out and can reduce overall fuel consumption. 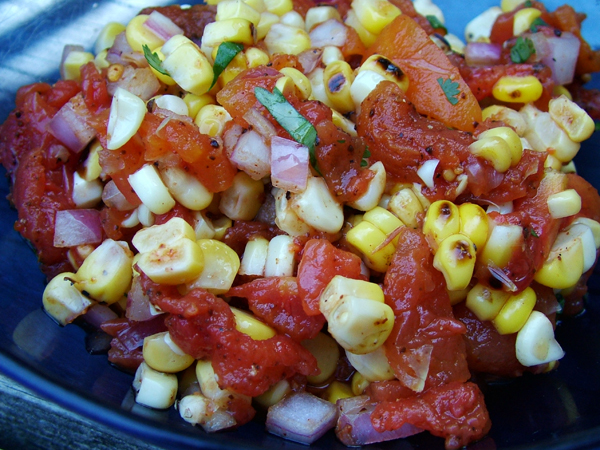 Salsa works well as a condiment for wraps or with your favorite brand of corn chips. It is also delicious on a bagel with some shelf-stable cheese or with tuna. I mentioned foil-pouched chicken. This can be yummy in a wrap with some rehydrated peppers and broccoli, and a bit of shelf-stable ranch dressing. Coleslaw is a great standby and dried, shredded cabbage comes back very quickly. Add some protein with a bit of freeze-dried chicken. 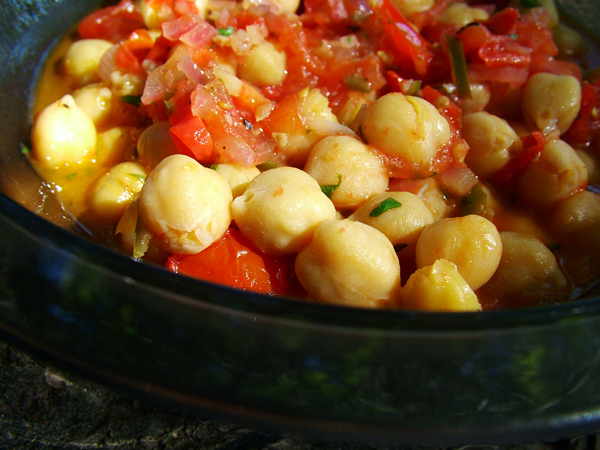 While I have many recipes for trail salads one of my favorites is the Garbanzo Bean, Tomato and Thai Chili Salad. This hummus-like recipe was originally created for a wilderness-cooking workshop. I often create several dips and dry them. 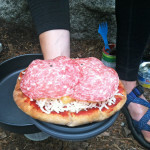 This way I can illustrate how easy it is to rehydrate this type of fare as a trail lunch without having to use a stove. The participants pass the dip around to munch on and this particular one always gets rave reviews. Roast the red peppers according to the instructions on page xref. Once they’ve cooled, peel them and chop them into 1/4-inch pieces. Combine all the ingredients in a food processor or large bowl if using a hand blender. Process them until you have a thick paste. If you need to increase your fat intake for cold-weather hiking, drizzle a little olive oil on the hummus just before you eat it. Fresh vegetables also make a great accompaniment for this dip. Preheat the oven to 350°F. Place the cut eggplant in a baking dish and drizzle with olive oil. Roast the eggplants for a half hour, turning once halfway through roasting. Remove eggplants from oven and let them cool. Peel them once they’re cool enough to handle. Using a food processor or hand blender, combine all the ingredients until you have a well-blended purée. Spread evenly on lined dehydrator trays, keeping the mixture about 1/4 inch thick. Dry for 7 to 10 hours or until the mixture is thoroughly dry. Rehydrate the spread using a formula of 1 1/2 parts dried mix to 1 part water. Wait 5 to 10 minutes and then add a little more water if necessary. Garbanzo beans, or chickpeas, have a buttery texture. This hearty and flavorful salad can be served warm or cold and goes well with flatbread. Heat the oil in a frying pan over medium to medium-high heat. Add the onion and sauté for a minute. Then add the garlic and tomatoes and simmer for a few minutes, until the tomatoes start to reduce. Add the peppers and ginger and cook for a few more minutes. Next add the chickpeas and lemon and lime juice. Simmer for a few minutes and then remove from the heat. Stir in the cilantro, salt, and pepper. Allow the mixture to cool and then measure the amount you will dry. Write this measurement on a sticky note. Spread the salad on lined dehydrator trays to dry. When the salad is dry, package it in a ziplock freezer bag along with your sticky note. Rehydrate the salad by adding enough boiling water to the mix to make it equal to the measurement on your sticky note. 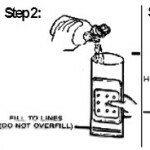 Do not add the water first or you will have too much liquid. If you’d like, you can rehydrate this recipe in time for lunch by adding cold water to the mixture at breakfast and letting it rehydrate in your pack. So, next time you are planning a trip menu take a close look and see if a no-cook lunch approach is better suited to your warm weather trips. Laurie Ann lives in Brant County, Ontario, Canada. She loves to escape the city as often as possible to backpack, hike, or paddle with her husband, Bryan, and her two children. Seeing nature through her children’s eyes is one of her greatest rewards and she remembers how special camping trips were in her own childhood. Her passion for the outdoors has gone far beyond hobby. 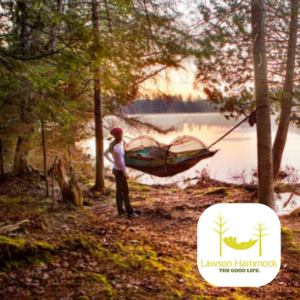 She is the author of two backcountry cookbooks and an instructor of wilderness cooking workshops in which she teaches the special skills needed to prepare food for wilderness excursions. Laurie is the owner of the popular Canadian e-zine www.OutdoorAdventureCanada.com. Her other hobbies include photography, sketching, and throwing dinner parties. Laurie's second cookbook, Another Fork in the Trail, is now available on a bookshelf near you.